Warner Bros. rolled out the highly-anticipated Steven Spielberg adaptation Ready Player One in over 3,500 theaters for sneak peek screenings last night, where it fared quite well, earning roughly $3.8 million. With these numbers in hand, it pushes the four-day projections from Thursday through Sunday from $45 million to between $52 and $55 million for this adaptation of Ernest Cline's nostalgia-heavy novel. While it will have two new competitors in theaters tomorrow, with Lionsgate's Tyler Perry's Acrimony and PureFlix's God's Not Dead: A Light in Darkness, it is still expected to dominate the box office throughout the Easter holiday weekend. Combined with the Wednesday night sneak peeks, the first day total estimate for Thursday is expected to be between $10 million and $12.5 million. Here's what analytical firm RelishMix had to say about the movie. "Fans of the novel by Ernest Cline, Spielberg movies and classic video games are 'all in' and ready to dive in the deep end. They are sharing their favorite moments from the trailers and the novel, and speculating how these elements might be portrayed by master craftsman, Spielberg. There are also questions about specific characters, the Oasis and its translation from a VR experience to film and much more, particularly coming out of mass wave of positive social buzz from SXSW. And again, Roblox gamers are definitely chiming in on the film's owned assets, too as questions swirl about a sequel and potential theme park installations." While Wednesday sneak previews and Thursday wide release debuts aren't entirely common, Ready Player One did outshine two recent examples, at least in terms of the Wednesday sneak peeks. 2014's Star Trek Into Darkness debuted with a Wednesday sneak peek of $2 million, en route to a $70.1 million opening weekend, while 2013's G.I. Joe Retaliation earned $2.5 million on Wednesday en route to a $51 million opening weekend that also fell on the Easter holiday. Here's what box office analyst Paul Dergarabedian said about Ready Player One, which closes out a rather weak March at the box office. "Ready Player One enjoyed a solid debut in pre-shows that portend strong opening weekend results. Generally positive reviews and viewer enthusiasm should ensure long term playability for the Spielberg-directed film. The marketplace could use a shot in the arm after a rough month of March that is substantially down vs. last year." The month of March is currently down 31% from a year ago, which comes after a record-breaking February, fueled by the massive success of Marvel's Black Panther. As of March 27, the box office is down 4% in total, year-to-date from last year, with $2.71 billion domestically thus far. 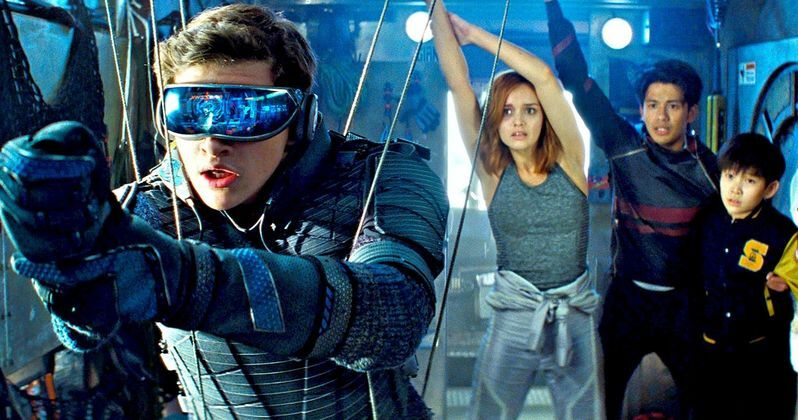 Ready Player One is already a hit with critics, boasting a 79% score on Rotten Tomatoes, as this spring blockbuster looks to give the box office a much-needed shot in the arm this weekend. Warner Bros. will roll out Ready Player One in a whopping 4,200 theaters, 700 more than its sneak preview rollout, which is more than double the theater count of its new competitors opening tomorrow. Lionsgate's Tyler Perry's Acrimony will debut in just 2,000 theater tomorrow, while God's Not Dead: Light in the Darkness is slated to open in 1,688 theaters, neither of which expected to give Ready Player One much competition. Variety projects that Acrimony is will earn between $7 million and $11 million when it hits theaters tomorrow, while God's Not Dead: A Light in the Darkness is expected to debut around $5 million. Neither Acrimony nor God's Not Dead: A Light in the Darkness have enough reviews posted to warrant a Rotten Tomatoes score, but that should change by tomorrow. Be sure to check back on Sunday for the top 10 box office estimates for the weekend of March 30, to see how Ready Player One fares in its debut. Will Ready Player One Be the Next Big Box Office Phenomenon?